Freshii remains closed in the Fashion Cafe at Lenox Square with no signs of life / reopening anytime soon, if ever. The healthy fast food eatery opened in the mall in March but had not done especially well. The food was good but seemingly priced too high for the casual food court diner. With burritos that exceeded $10, Freshii priced themselves above similar offerings of burrito juggernaut Chipotle Mexican Grill. A leak that reportedly originated at California Pizza Kitchen surely also played a part in the restaurant's closure. 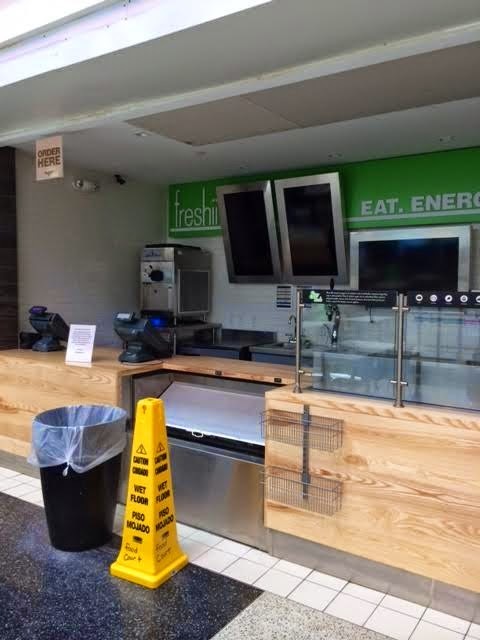 As of this week, it appeared as though water was still leaking from the ceiling above Freshii. Cook-Out is planning a location for - you guessed it - a former Mrs. Winners! A new Cook-Out will open in Gainesville, Georgia on Jessie Jewell Parkway in a converted Mrs. Winners. A new restaurant is coming soon to the shuttered China Garden II on Jett Ferry Road in Dunwoody. The previously announced Rocks Chicken at Phipps Plaza will reportedly be a "test concept" from Johnny's Rockets. Steve Snyder Jr., who already operates the Moe's Southwest Grill and Johnny Rocket's in Phipps Plaza, is making this new concept his third in the popular Buckhead mall. The Real FIX Pizzeria in Historic Downtown Roswell has been delayed yet again, and will now open September 2nd...or else! The final Sprouts Farmers Market opening in metro Atlanta this year will be in Johns Creek on September 17th. The store opens in a former Shoe Gallery space within Johns Creek Town Center at the northwest corner of McGinnis Ferry Rd and Peachtree Parkway. New Sprouts stores have recently opened in Snellville, Dunwoody and Peachtree Corners.